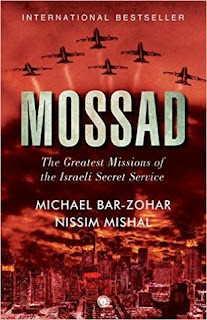 This is a book on some of the most daring missions carried out by the Israeli secret service agency - Mossad. It was written by Michael Bar-Zohar, a former member of the Knesset and Nissim Mishal, a political reported based in Israel. Mossad is possibly one of those words we keep coming across while following international politics considering they are always in spotlight for; most incidents in Arab nations were always blamed on Mossad (in some cases, rightly so), especially post the assassination of a Hamas leader in Dubai in 2010. 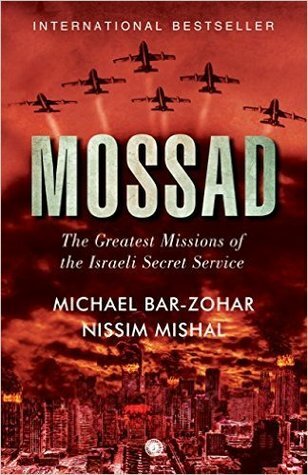 This book covers 22 such missions of Mossad, starting from the days Israel's foundation till the assassination of the Hamas leader Mahmoud Al-Mabhouh in Dubai in 2010. It covers some of the most famous operations of Mossad, such as abduction of the Nazi War Criminal Adolf Eichmann from Argentina, a full chapter on the acts of Elie Cohen; a Mossad spy who nearly became the Deputy Prime Minister of Syria, Operation Entebbe in Uganda, etc. This book was fast paced; which seems quite a contradiction considering it was not a work of fiction but then, all the missions were narrated in a very interesting manner that it was almost like reading a real espionage novel, just without the dialogues. I felt the authors also had a good mix of certain very famous events such as the Israeli operation in Uganda in Entebbe Airport to neutralise the hijackers, the abduction of Adolf Eichmann, assasination of Al-Mahbhouh, the acts of Elie Cohen in Syria, etc. along with certain less known events such as sabotaging the nuclear programmes of Syria and Iran, retrieving the young boy Yoselle Schumacher from ultra-orthodox Jews, the capture of Mordechai Vanunu - a former technician at Dimona (Israeli Nuclear Programme) who revealed the details of the reactor to the western media, etc. The authors also brought out the personalities of the various Mossad heads very well, such as Isser Harel, Zvi Zamir or that of Meir Dagan and how a lot of decisions were influenced directly by the Prime Minister, from David Ben-Gurion to Benjamin Netanyahu. However, the authors tried too hard to make this book a fast paced one; which even turns out as a bit of a disadvantage for, when I pick up a non-fiction work, I know what to expect and there is no extra need to go beyond the ordinary to make it more interesting; for instance, I felt a lot of descriptions of the events were a way too far-fetched or exaggerated considering the detail that with which these two authors described while they weren't even the ones who carried out the operations nor are they ones who conducted interviews with all those people involved. Moreover, they tried too hard to show that Israel was always right to the extent of fudging facts a little; for instance, in case of Mordechai Vanunu, the far-left anti-nuclear weapons activist; the authors made a remark that Vanunu was no crusader but merely someone who wanted to grab attention as, if he wasn't sacked from his job, till date he'd have been working there even though, in reality, Vanunu had actually resigned from his job. This enjoyability of this book largely depends on an individual's political position, I believe; someone who has a pro-Arab position might feel enraged as to the extent the authors go on to portray vicious killings as acts of heroes whereas a person who has a pro-Israeli view might feel awed by the extent to which Mossad is willing to bend to ensure security of their country. On the whole, I enjoyed reading the book; of course, I would have liked it if the authors had taken a relatively more neutral position but then, that is understandable, considering their background and on the whole, I would award the book a rating of seven.